Other colours shown below are subject to a minimum order quantity, please request a quote. 1 x 80mm Red/White retroreflective band. 1 x 80mm Red retroreflective band. 1 x 80mm White retroreflective band. 1 x 80mm Amber retroreflective band. 1 x 150mm Red/White retroreflective band. Admiral Bollard is a broad-stemmed bollard ideal for use as a junction marker. 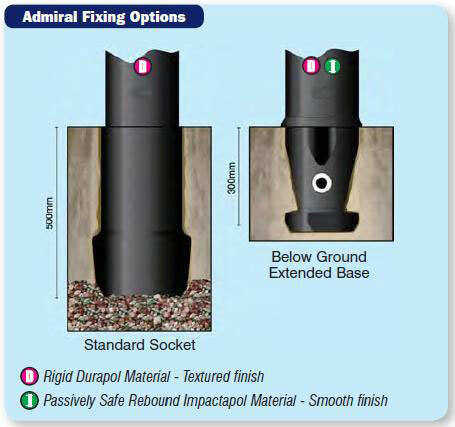 Admiral Bollards are cost effective and require minimal maintenance. Rigid socketed or Rebound and Rigid concrete-in models available. Rigid Durapol Model: White, Black, Millstone, Sandstone, Aircraft Grey, Stone. Rebound Impactapol Model: White, Black. Bollard: Passively safe Impactapol® Material or rigid Durapol® Material. As part of the Scottish Traffic Calming Regulations, traffic calming features such as speed humps, pinch points, chicanes and narrowing roads are a regular feature on Scottish roads. This is to help lower vehicle speed, to reduce the number and severity of accidents and encourage appropriate driver behaviour.